I've been a stalwart supporter of GME for years, and this new release will keep me enthusiastic. The pioneer in multimedia encyclopedias continues to both enrich the content and attempt to keep on top of the network technology. According to the promotional flyer, GME 97 now boasts 35,000 feature articles, 1,200 maps, 10,000 pictures and illustrations, 15 hours of audio and 200 separate video clips. In terms of links, there are 500,000 internal hyperlinks and 20,000 external hyperlinks to Internet resources. According to Grolier's product comparison chart, GME97 leads Encarta '97 Deluxe every category except the numbers of images. While I can't confirm the statistics, I can confirm that GME97 excels in its peer group when it comes to content - the articles and features are of consistent high quality for a general purpose interactive encyclopedia. Further, generic, wild card, Boolean search capability is available for all media types and categories. The national anthem of Mauritius, a movie of Lindbergh's first flight, and a street map of Washington, D.C. are just a mouse click away. What's not to like? Figure 1 depicts a rather typical session. In this case our search for Alexander the Great produces 17 documents while we review Alexander's place in history on the timeline. With a little experience, the interface is useful and efficient. The interface is really the only significant drawback of the product. Grolier continues to struggle with an ad hoc, inconsistent interface. The navigation through the media categories by topic is somewhat awkward, betraying a lack of overview from human factors folks when the product was first developed. I suspect that Grolier's is trying to avoid a major overhaul by making patchwork refinements with each version. This hurts the product somewhat because it discourages casual investigation of the product which would reveal considerable strengths. 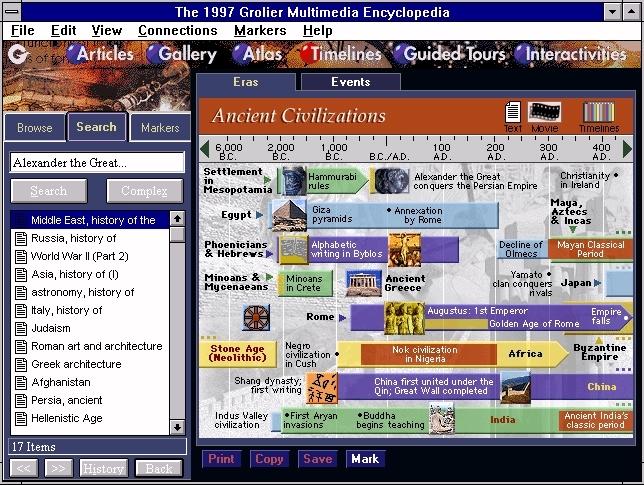 Something as simple as an encyclopedia interface should never require a manual, but I doubt that the typical teenager could get by with GME97 without one. Just as an illustration, some of the "interactivities" options work like radio buttons while others require the use of prompts. Also, the creation of a list of entries by media type requires four mouse clicks and three menus. Further, the buttons highlighting (e.g., for complex search) poorly identifies the button as a current option. Finally, the multimedia windows are not in general moveable. Those who use World Book and Encarta are likely to find this interface bothersome. However, the content makes it all worthwhile for this reviewer. GME97 remains a premiere desktop encyclopedia. Windows NT users beware. This product is designed for Windows 3.1 and 95 only. My Win95 installation went seamlessly. But, I'm an NT-o-phile now and will not be discouraged. Even though it is not intended for NT audiences, it can be made to work with a bit of tweaking like changing the default Quicktime draw method to Bitmap BMP. (Ignore the scores of error messages which the installation program produces). I still have a few intermittent problems with unreadable time line titles of random question marks and a few of the animated videos which lose their sound. But, it is testament to the quality of the product that I am willing to work around the occasional hassles to have GME97 available on my NT workstation.